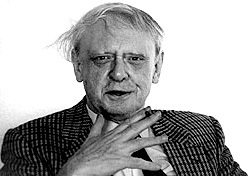 Anthony Burgess was the other writer nominated for the Booker Prize in 1981, the year it was won by Willian Golding for Rites of Passage. The quality of both that and Burgess’s Earthly Powers may be deduced from the fact that that is the only year in which just two novels were nominated. 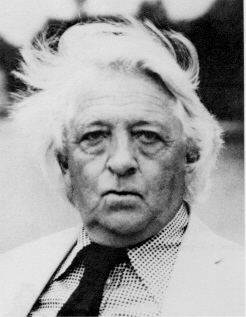 Burgess then was phenomenally unlucky, for many worse novels than his have won the prize, both before and after. Earthly Powers was a tour de force, which brought together much contemporary history in dazzling combination. The narrator was an aging homosexual writer, who began his story with ‘It was the afternoon of my eighty-first birthday, and I was in bed with my catamite when Ali announced that the archbishop had come to see me.’ The catamite was also his secretary, which contributed to the belief that the narrator, Kenneth Toomey, was based on Somerset Maugham. The archbishop has come to ask Toomey to help with the canonization of Pope Gregory XVII who seems to be based on several Popes, beginning with Pope John the XXIII (in whose times this Papacy is set) and including the 1981 incumbent, John Paul II, in terms of Gregory’s charisma and presence on the world stage. The mainspring of the story is a miracle the future Pope had performed in curing a little boy who was on the verge of certain death. The child grows up however into an evangelist who exercises control over those he converts, to the extent of persuading them to join him in a mass suicide. This is based on the Jim Jones incident in Guyana, where an American charismatic preacher persuaded his flock to imbibe FlavorAid laced I think with cyanide. The question then is whether the miracle wrought by the future Pope was aided by God or by the devil. Few British writers have been awarded the Nobel Prize for Literature in the period since the Second World War. These include Winston Churchill, probably from sentiment about other achievements rather than actual literary excellence. His various histories, though well written, are not especially ground breaking, certainly not like those of Theodore Mommsen, the other historian to win the Prize. If I recollect right, the only other non-creative writer to win was Bertrand Russel, in his more anarchic phase, so he refused to accept it. 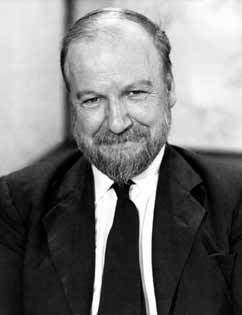 Perhaps the least controversial English winner was Willam Golding, who received it towards the end of a career of half a century. He came to prominence with what is still his best known work, Lord of the Flies, which turns traditional schoolboy adventure stories on their head. The plot involves a group of schoolboys cast ashore on an island after a plane crash, a situation that leads the reader to expect a tale of resourcefulness as they use their intelligence and their skills to survive – as happened in Robinson Crusoe and Swiss Family Robinson and most notably, without adults, in Coral Island. However what happens here is much more realistic, as the boys degenerate into savagery. A few boys manage to cling to civilized values, two of them being punished for this by death at the hands of the herd. The sole surviving proponent of decency, the original leader Ralph, who had been deposed, was being ruthlessly hunted when rescue finally arrives, to restore civilization in a fairy tale ending that is nevertheless appropriate since it helps to set things in perspective – the naval officer who finds the group sees a host of little boys with their faces painted, and assumes they have been having a game with the fugitive. 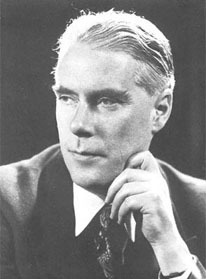 To my mind the most perceptive observer of British society in the period after the Second World War was Angus Wilson, a writer of enormous skill who has not received the critical recognition he deserves. In addition to writing fiction of great distinction, he was also a perceptive critic and biographer, and his The Strange Ride of Rudyard Kipling is one of the most illuminating accounts of that complex character. He wrote too about Dickens and the 19th century naturalist French writer Emil Zola, which indicates the wide range of his sympathy as well as his knowledge. He was born in the same year as Orwell, but took a long time to publish, beginning only just after the war with a couple of short story collections. These, The Wrong Set and Such Darling Dodos, carried sharper versions of the critiques of literary and genteel society that Anthony Powell had already engaged in, in his earlier work. Wilson’s skill in exposing pretensions as well as commanding sympathy for weakness was evident here, but he really came into his own only in 1952 with Hemlock and After, a vivid account of a married homosexual writer dealing with shortcomings in his own personality. The turning point in his understanding of himself comes when he sees a man being arrested for soliciting in Piccadilly, one of his own haunts, and finds himself baying for blood along with the rest of the crowd. The revelation of his own defensive instincts causes him more anguish than the possibilities of exposure through blackmail and outside enemies. In looking at the question of national integration, which should be our principal goal now that we have eliminated terrorism from at least Sri Lankan shores, we need to begin by considering the factors that so nearly caused disintegration. Firstly there was the sustained neglect of areas in which minorities lived. This was not particularly targeted at the minorities, since Sri Lanka suffered for more than 50 years after independence from development without equity. 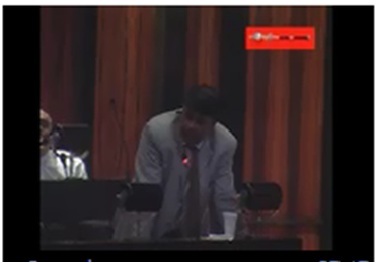 This has resulted in the Western Province hogging the lion’s share of per capita income, which is why many areas in the country still suffer from high levels of poverty even though the country as a whole has now moved to middle income level. Secondly, there were measures which in intention as well as in effect were clearly discriminatory. 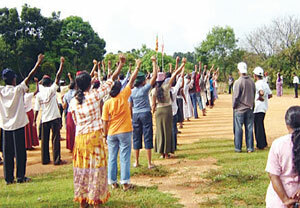 The most upsetting in this regard was language policy, not only the constitutional measure declaring Sinhala the only official language after an electoral campaign in which both major parties seemed to think being negative about Tamil was the key to electoral success, but also the educational system that straitjacketed many children in monolingualism. Another upsetting measure, still remembered with bitterness as I found last week in dialogue with Tamil members of the diaspora in London, was discrimination with regard to University admission. This is all the more significant in that Mr Prabhakaran’s was the first school cohort affected by the new system, even though in its overtly racist form it was only formulated in 1978. I have thus far considered writers who dealt obliquely with the social changes that the Second World War brought. There were many of course who explored the subject more directly. To my mind the one who stands out amongst these was Anthony Powell, and the title of his greatest work, A Dance to the Music of Time, testifies to his purpose in this regard. The work consists of twelve volumes, which together present a panoramic view of social change over the second and third quarters of the century. At one stage, when I thought my energies limitless, I contemplated of a comparative study of this and the similar sagas for earlier generations of Galsworthy and Anthony Trollope. I finally settled down to the much more limited study of Trollope’s treatment of women and marriage as compared to that of his own peers, but I have often thought the larger study would be fascinating, in terms of techniques as well as subject matter – including relations between sexes and classes. Powell wrote four sets of three books, and I had made the mistake of starting in the middle when I was still a schoolboy. The book I first read was Casanova’s Chinese Restaurant, one of the second set, which was the least interesting of the four. I then avoided Powell for some time, before starting on the very first book, A Question of Upbringing, which had me hooked. Were the humanitarian agencies guilty then of double dealing? Were they in fact hand in glove with the terrorists? Sadly there are some people in Sri Lanka who believe this was the case, their suspicions fuelled by one incident in which an NGO concealed from us for weeks that the terrorists were using their heavy equipment for building barriers. In that case I believe there was some connivance, but in general I have long believed that one should never ascribe to wickedness what can arise from incompetence. In the Sri Lankan case I believe that much of the problem was due to sheer incompetence, combined with a situation which privileged such incompetence simply because it was foreign – and the refusal of foreigners, who naturally hang together, to admit culpability even in obvious cases such as the one noted above, which naturally leads to general suspicions. Adding to this was the strategy of the terrorists, to confer exalted status upon their international interlocutors, and sadly many foreigners fell for it. I recall still the European Union trying to draw up Modes of Operation for humanitarian work, in which they claimed that external agencies should hold the balance between the concerned parties, ie the elected government and a bunch of terrorists. Fortunately I was appointed Secretary to the Ministry which was in charge of aid coordination shortly after I had first objected. At the next meeting I attended the EU officials grandly said that the clause could not be changed because it had been agreed previously, but I had to tell them that I was not there to negotiate, but to tell them what government policy was, as laid down by my Minister. Needless to say, they soon lost interest in this framework, which they had been anxiously pursuing previously, in order I now believe to enshrine their own importance.